Editor’s note: We conclude our series on Christmas in faraway lands with this look at celebrations in Laos. Laos is a Buddhist and a socialist country, so there is no long holiday intended for the celebration of Christmas. It usually is a one- or two-day event among Christian groups. Christmas is celebrated only by Christians, who make up a minority in the country. Statistics show that about 1.5 percent of the population of nearly 6.6 million practices Christianity, as of 2012. 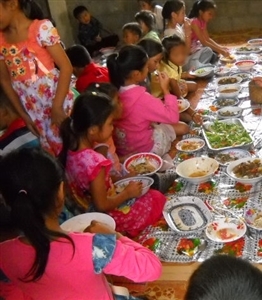 Lao children enjoy a Christmas meal, one of the simple traditions shared by the few Christians in a socialist country where the main religion is Buddhism. Photo from B. Barte. For Christian churches in Laos, Christmas is the most awaited and the biggest event of the year. But I do not mean in a luxurious way that most of us are familiar with in terms of decorations or gift-buying. Christmastime in Laos is much simpler, although similar in many ways; and indeed, it is still preserved from the commercialized Christmas celebration that many people are oriented to now. The celebration of Christmas in Laos is very much still focused and centered on the gift of Christmas: Jesus Christ, who is our Savior and Lord! As with many worldwide Christian celebrations, most preparations include presentations by church members in the form of songs, dances, dramas and homilies that tell the story and give meaning to Christmas. Celebrations include fellowship and the sharing of food, however simple; there may also be some games that follow for various age levels, and some congregations may have gift giving. During Christmastime, the local officials are more open to Christian churches in their celebration, and they usually respond to the invitation to join in. Thus, Christians use this event to invite non-Christians and some government officers to witness the Christmas presentations with the hope that they would have a better understanding of our Christian faith, culture and traditions, and most importantly that they may also hear and know more about Jesus Christ, our Lord and Savior. Furthermore, this is to encourage a better relationship with government officials, to show them that Christians are their friends and partners in ministering to the Lao people. So Christmas is a moment to not only celebrate but share God's love and foster a better relationship among non-Christians in a community where many of the Christian churches are not recognized, or their recognition is limited and in many ways at risk. 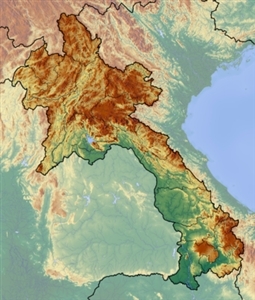 Laos, sandwiched between Vietnam to the east and Thailand to the west, has a tropical climate but enjoys some cooler temperatures during the winter. The day of celebration for the Christmas event varies from church to church. It can be anytime within the first week of December to the first week of January, depending on the churches’ situations and the church members’ availability of schedules, as they have to consider the government calendar and work, school or farming schedules. It can also depend on the church set-up in the villages. For example, if congregations are only allowed to meet on weekends, then they would celebrate on a Saturday or a Sunday; or if there is a local event hosted by the government on some particular days, then they have to do church celebrations before or after the said government gathering. In the Christmas 2012 celebration, the theme for Lao Christians was "Christmas is given. Christmas is Jesus. Jesus is given. Christmas is Jesus: so simple, so pure." * B. Barte is an ordained clergy member serving in education in Laos whose work is supported by the Florida Conference. To learn more about her work and how you can help, click here.